per cent of what I have seen in darkness. The Premier fixed frame screen is what we designed when we wanted the best product that smart money could buy. It ships in a very long box, usually via freight truck, because we kept the top and bottom frame pieces continuous. We designed it to handle long spans without splicing or support and the ability to be curved, equipped with masking panel magnets, or any of the above. Measuring a beefy 3.3" x 1.6", we designed the Premier frame to have as robust a frame as screens costing several thousands. We also upgraded the wall thickness to easily resist sag to 210". The .093" wall thickness is 50% thicker than many major screen companies frames priced thousands higher. With the large profile, heavy walls and 360-degree O-ring tension, the frame is acoustically deader than Elvis. 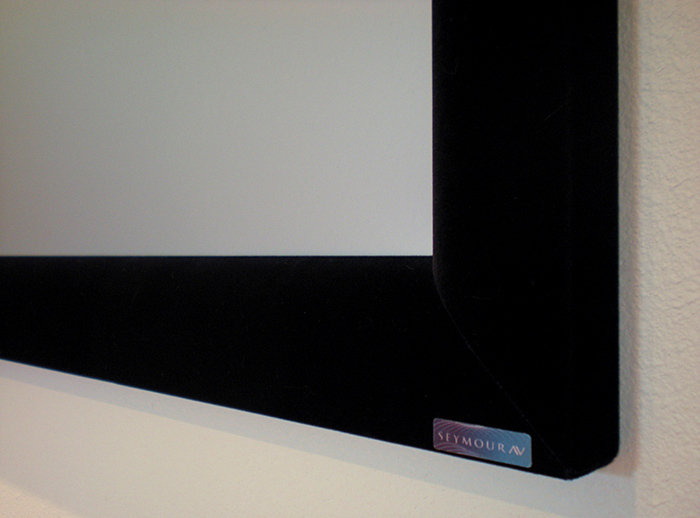 The Premier fixed frame screen is the only screen anywhere that uses the world's highest quality, blackest material available, true Fidelio ultra-premium velvet. You can pay three times the price and not come anywhere near the light-absorption quality of Fidelio velvet, also made right here in the US and used to line the cavities of research telescopes. At 0.3% reflectivity, it is even better than the 0.4% reflectivity fabric velvet with finished edges we have made for the retractable screens, and up to 25 times more absorbing than border materials from major screen companies at similar prices. Our 3.3" wide Fidelio borders with an elliptical contour give you the ultimate overscan absorption, a boost in perceived contrast, and a floating three-dimensional look to the image. Our curved frame option features a 40' radius, which is perfect for fixing the pincushion, or bow-tie shaped distortion from anamorphic lenses that stretch a 16:9 ratio projector to 2.37. Using an anamorphic lens will improve your resolution by 33%, your light output by up to 20%, and immersion by three mojos. The curvature is shallow enough, however, for those that use the simpler zoom method and want the dramatically increased sense of immersion that only a curved screen can offer. For that IMAX® feel, opt for a custom curved 16:9 screen. While less acoustically transparent screen materials from other companies tout their curved frames ability to allow you to angle your L/R speakers inward, our Center Stage material is far more acoustically transparent and you can angle your speakers however you want behind the screen with immeasurable difference. With our new high gain Matinee Silver or Black, curving the frame will increase brightness, improve uniformity and allow you to mount your projector closer. 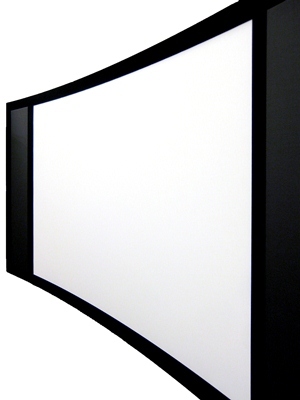 Our fixed masking panels will easily convert the curved screens to 16:9 ratio with magnetized ease. 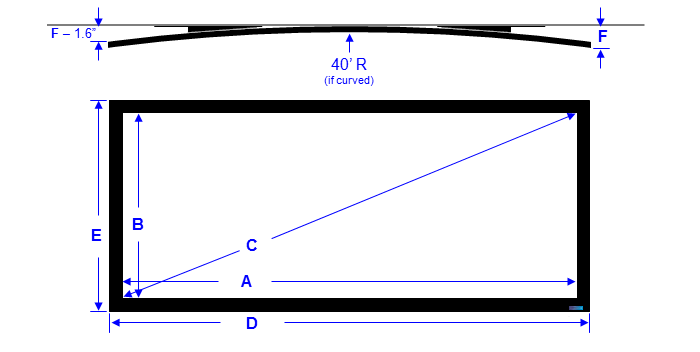 Curved 16:9 and 2.07 constant area screens are also available upon request. Above is a 150 in. 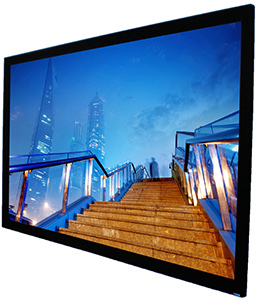 wide, curved frame Center Stage XD 2.37 screen, optional Millibel CH panels with 3.5 in. wide interior velvet. Black Backing layer. For Center Stage screens, the cost for this option starts at $238, depending on size. Most folks don't need this, as it's usually easy to darken the surfaces behind the screen. It can be installed later if you need, using half the o-rings from your screen. Non-AT screens never need a black backing layer. Four way masking, constant image area (CA) screen. If you like the idea of a constant area, four-way masking screen but the $20k+ prices for motorized versions leaves you less enthusiastic, we have a killer value for you. Special order a 2.07 ratio screen with a set of CW and CH panels. Curved frame. Curving the screen, typically for use with an anamorphic lens for 2.37 output, improves resolution, brightness and immersion. We can curve any CH, CW or CA screen and the masking panels too. Drilled and threaded holes. We can drill and thread holes on the sides or top of the frame if you need. Black eye bolts. For those who need to hang the screen from the ceiling, request that we drill and tap on the top of the frame, and include eye bolts. Stainless steel cable. For a classier look than chain, we can precision cut and Nicopress® specific lengths of 0.032" diameter SS cable for you to hang your screen from. Frameless zero-edge. For a borderless literally zero-edge look, order an optional frameless screen. We put the black frame behind the image and cut the screen to wrap around the front of the frame. There is a picture of this type of screen in the fixed frame installations page. You can even order magnetic panels for a frameless screen. Our Facebook page shows this unusual configuration. Magnetic bottom wall pulls. Not all walls are straight, so if you'd like (or need) a pair of strong Neodymium posts that screw into the wall and pull the bottom corners, let us know. Custom sizes Need to fit in between something? We can make your screen to any critical dimension to a 0.1" resolution. We don't charge extra for this, but simply round up to the next standard size. H or F (flat) 1.6"
The Precision fixed frame screen features a mid-sized border to fit more image into a cramped space. With this frame, we also make available the same reference quality screen materials but at a savings of 30%. This frame keeps the same easy rubber band installation, and now features a full velvet wrap in our Baritone™ premium velvet. With heavy duty hardware at prices where we not only compete with imported screens, we export our all-US product to their countries. While you can buy a large company's screen at several times the price and get plastic corner brackets, our Precision frame includes the same 7ga steel corner brackets from our Premier frame, making for a total of 2.4 pounds of laser cut plated steel. Designed to handle spans up to 130" while being both easy on the budget and installer. The Precision frame is wrapped in a velvet that we developed that offers nearly the performance of the Premier frame's Fidelio but at a much better value. While we reduced it's frame width down to 2.6" wide, we nearly tripled its wall thickness compared to imported screens so we can provide that thinner border look without sacrificing performance. The Precision frame includes the same elliptical contour of our Premier frame giving you a much more sophisticated look than some large brands' box tubing, while eliminating shadow lines on your image. By splicing the top and bottom pieces we're able to save you money on Center Stage or Glacier screens (the Matinee screens need the upgraded, continuous frame). It ships in a much smaller box because we spliced the top and bottom frame pieces with a pair of beefy 12" long laser cut 7ga plated steel bars. Like our Premier frame, because we make these to order here in Iowa we can make any custom size for you to the 0.1" resolution. This way you can literally do an interference fit to any critical dimension in your installation. If the splice is an issue for you, however, we can quote you a continuous top/bottom option. The higher shipping costs are typically +$135. Continuous top/bottom frame. For Center Stage and Glaicier screens, a spliced top/bottom frame is an attractive cost savings as standard feature. While any Precision frame can be made continuous, for Matinee screens, due to their reflective nature we strongly recommend you upgrade to the continuous top/bottom frame option. The freight trip results in a better end product. Black Backing layer. For Center Stage screens, the cost for this option strts at $238, depending on size. Most folks don't need this, as it's usually easy to darken the surfaces behind the screen. 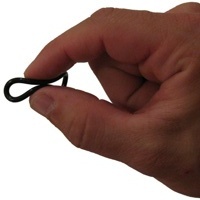 It can be installed later if you need, using half the o-rings from your screen. Non-AT screens never need a black backing layer. The new Metro frame is our thinnest yet, perfect for contemporary multi-use living rooms. At 1.5" wide, we moved the mechanics behind the screen attachment area so we could then cover over the o-rings and grommets with removable 1.5" wide trim pieces. The result is that you get a robust frame system, hidden from view, in a screen that still ships to you rolled up in a box. The Metro frame maxes out the available image size of our Matinee ambient light rejecting materials and still offers industry leading overscan absorption from Fidelio velvet. Tunable white bias lighting. Adjustable from 3,000K to 20,000K (warm to cool white), this option for the Metro frame can compensate for a range of room colors so that your bias lighting is the correct color temperature. Calibrating your bias lighting to match your 6,500K image calibration assures you're not color shifting at low IRE like those other UFO dance light kits do. Wood trim Inquire about a custom hardwood veneer wrap on the trim. Bubinga, anyone? Max image width 210" 130" 180"
Continuous or spliced horizontal frame pieces Continuous Spliced (continuous is an option) Continuous, Spliced 150"-180"